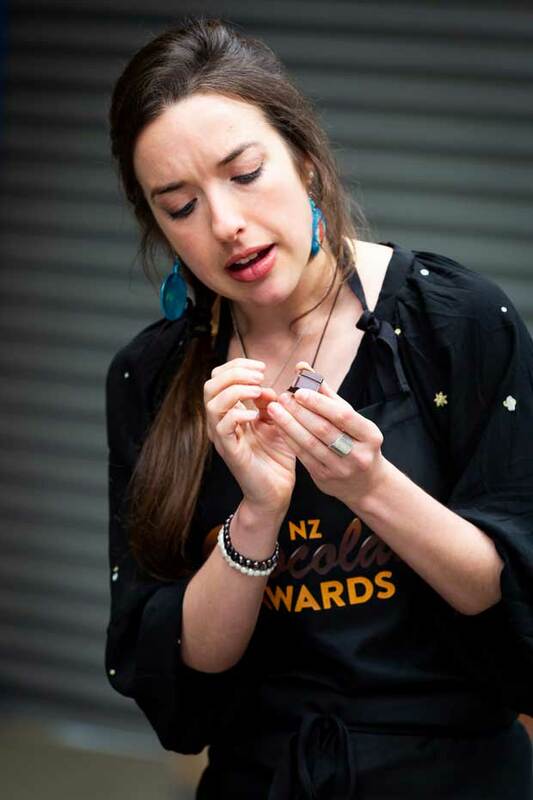 Emma Rawson gets serious about chocolate. 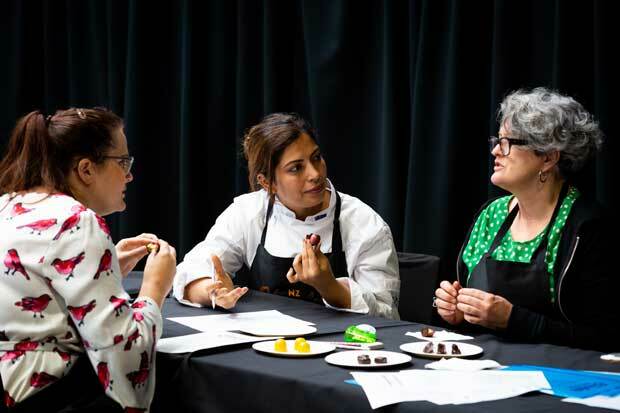 From “bottom leakage” to “fat bloom”, Emma Rawson brushes up on her chocolate lingo to join the world of bonbon judging. It’s a kid’s dream to be a chocolate judge. At age four, chocolate – and the procuring of it – was my raison d’être. I once stooped to stealing my brother’s Easter chocolates and hoarding his crème eggs in my dollhouse. 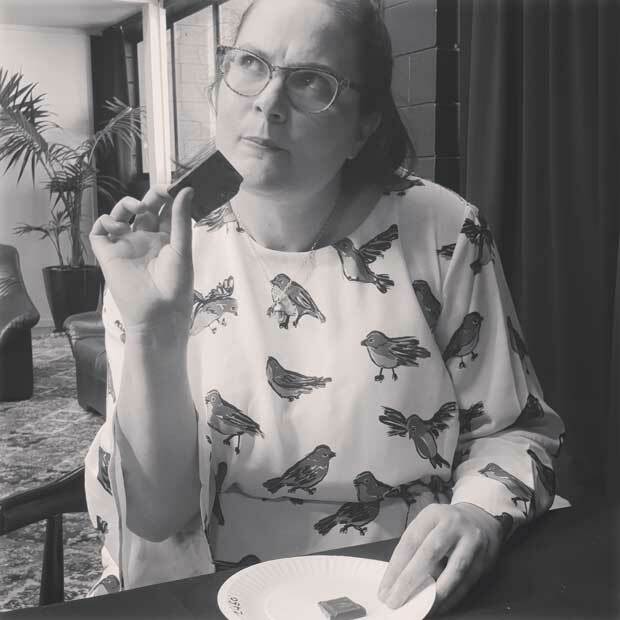 At 36, I’m no longer pinching it – and I’ve since graduated to craft chocolate – but I’m still feverishly fond of the stuff. 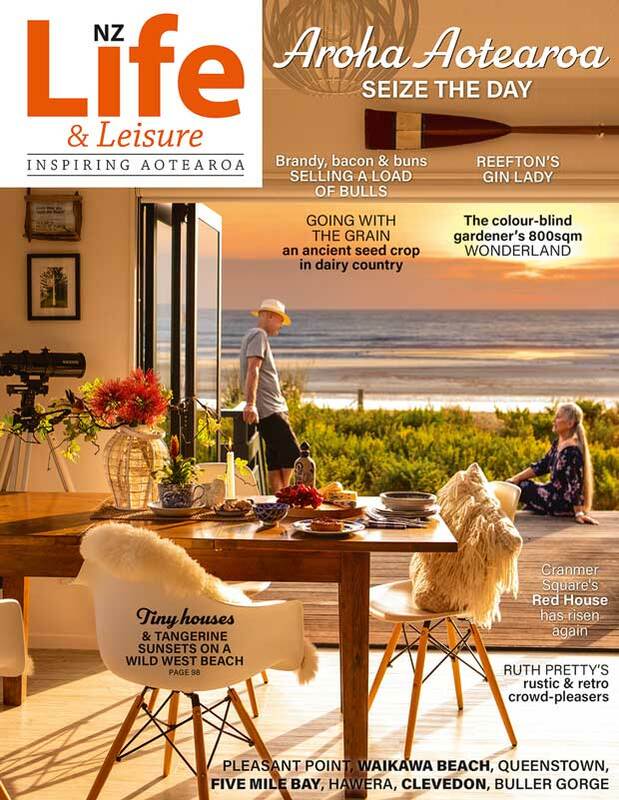 On a recent visit to Hawa’ii, I abandoned the beach to head into the hills and sample raw cacao fresh from the pod at one of the world’s best chocolate farms (read about that in NZ Life & Leisure Nov/Dec 2018). 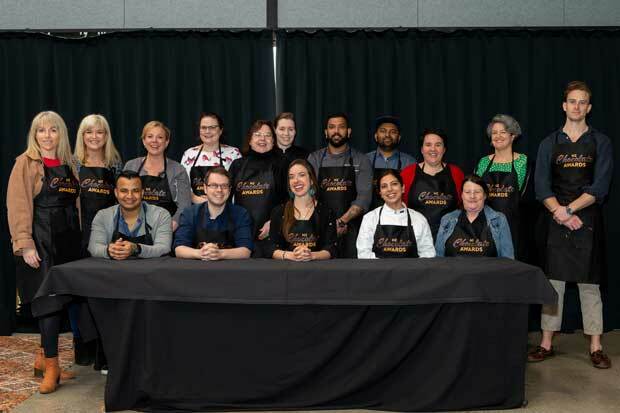 The judges at the NZ Chocolate Awards. “Is this a joke? 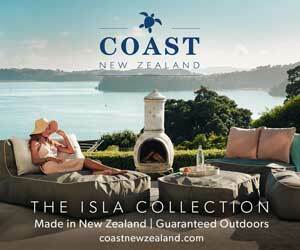 Of course, I will” I reacted when asked to judge at the recent New Zealand Chocolate Awards. How proud did I feel that the misdemeanours of my childhood, and a consistent consumption of chocolate since, might finally pay off? I would take this honour very, very seriously. Chocolates are tasted blind. 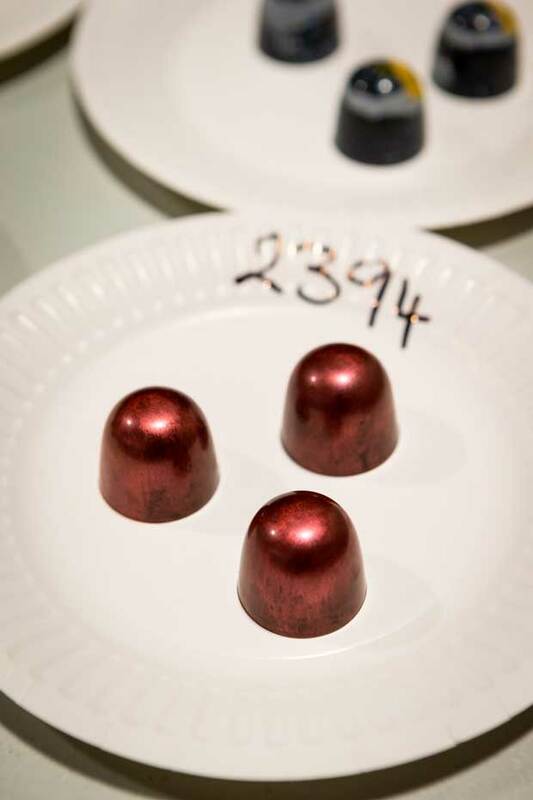 The judges are given flavour notes, but do not know the makers of the chocolates. Going without coffee is a big ask, and I’m not alone in feeling the challenge. As we assemble at 9.30am (who says chocolate isn’t a breakfast food? ), the cranky judges are clearly suffering caffeine withdrawal – definitely my people. Our official aprons are handed to us and I’m slightly disappointed. I was secretly hoping for a full Willy Wonka purple suit and top hat. Within seconds, I’ve chocolate in my fingers and I’m Charlie with his golden ticket. Elle Coco explains the chocolate tasting process. Sight – Good chocolate has a satin sheen on the top and colour is important. Dark chocolate should be dark brown, never black. White streaks or swirly patterns in the chocolate are a bad sign. These “fat blooms” are a sign the chocolate may not have been correctly tempered (heated to distribute the ingredients evenly). 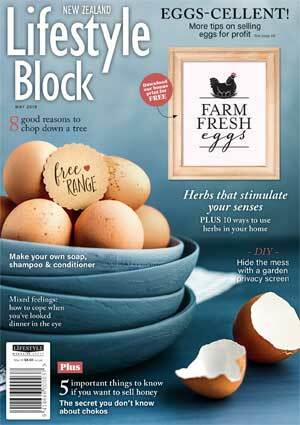 Feel – Break off a piece of dark chocolate and melt between thumb and forefinger. If the chocolate is of good quality, fingers will absorb the cocoa butter and a powdery residue of the cocoa mass will be left. Sound – Good chocolate, with a decent cocoa content, will audibly snap when broken. 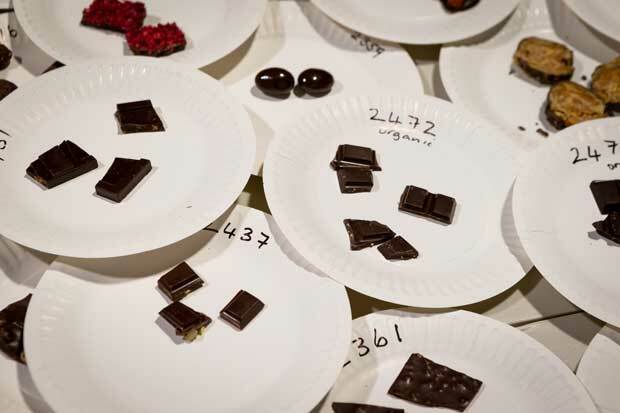 Smell – Like wine, chocolate has flavour notes that are detectable when sniffed. Beans from specific regions are known for spicy, grassy or fruity notes. Taste – Finally it is time to eat the chocolate. Break off a piece, place it on the tongue and lift to the roof of the mouth. Let it melt. We must breathe in through the mouth, momentarily hold the breath, breathe out. This allows the flavours to develop. Elle says some characteristics grow on the palate for 15 minutes. Mouthfeel – Chocolate should feel silky smooth and melt evenly. Once dissolved, there should be no wax texture remaining in the mouth. 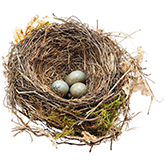 A waxy taste might mean fats other than cocoa butter have been added or that it has been poorly tempered. From left: Emma Rawson, Jasbir (Jaz) Kaur and Ginny Grant. My judging group is assigned to bonbons and filled chocolates. It’s a tough life. Elle flits between the tables like a firefly, advising what to look for in each chocolate. It’s all about first impressions in the bonbon category. Looks are essential; lo and behold should there be a leakage! Sadly we note some “bottom leakage” oozing from a banoffee caramel bonbon. 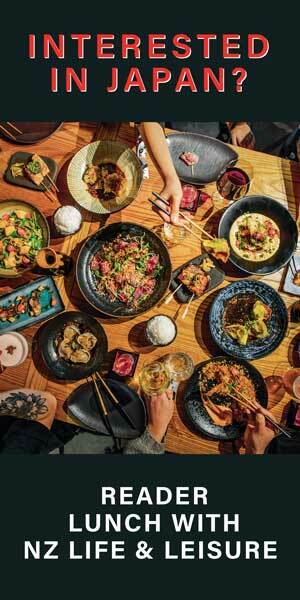 We need our sense of smell to unlock the flavours: is that blue cheese? It’s too funky for even this cheese-lover. Liquorice and blackcurrant? Delicious! Pieces of apple, plain white bread and sips of water between tastings cleanse our palates and are a little penance for our sins. It’s serious business but I feel guilty for having so much fun. However, I do thank the chocolate angels not to be on the bean-to-bar category. Luke Owen Smith of Wellington’s Chocolate Bar is in a heated debate with pastry chef Ganesh Khedekar (a New Zealand representative at the 2016 Culinary Olympics) and Harbourside’s head chef Shaun Tyagi. While their comments are inaudible, their dramatic gesticulations and the waving of samples at each other suggests the difficulty of the judging and reflects the high standards of entries. 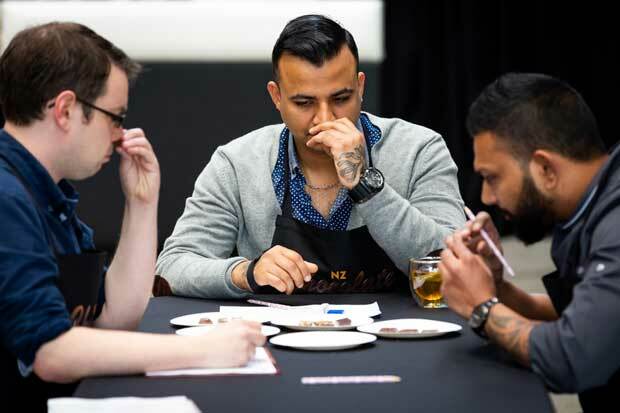 From left: Luke Owen Smith, Shaun Tyagi and Ganesh Khedekar assess the bean to bar chocolates. Meanwhile, our table is eating its 12th caramel in a row and I’m in fits of giggles with my fellow judge Ginny Grant. We’ve already hit a sugar high, I have chocolate all over my clothes and my face and we still have our final subcategory to go: alcohol-filled chocolates. I get some coffee in the espresso martini chocolate and hit another high. Judging is over and scores are meticulously cross-checked, ensuring one panel is not grading too high or too low. Our table loved the blackcurrant and liquorice chocolate but it scored less favourably with other judges. Oh well, can’t win them all. After an hour or so, with judging calibrated and all scores calculated, a supreme winner is declared. Sorry, we’re all sworn to secrecy. Wait for the announcement on Trophy winners (Best in Class) announced on October 5 ahead of the NZ Coffee and Chocolate Show Saturday 6 and Sunday 7 October.